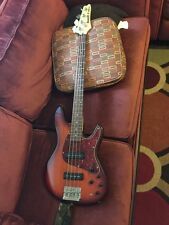 Original Owner Ibanez TR500 Expressionist Bass. Great Condition, hasn’t been out of it’s case in 15 years. Case not included. A guitar doesn't have to cost a bundle to sound good. 4-String Electric Bass Guitar - Transparent Red. Bridge : B10 bridge (19mm string spacing). Radius : 305mmr. D : Thickness at 12th : 22mm. C : Thickness at 1st : 21mm. Bridge - B10 19mm String Spacing. Electronics - Active Phat II 2-Band EQ. Fretboard - Jatoba. Trans Green color. Very nice condition overall. Solid Body. Maple neck. Rosewood Fingerboard. Could be used for parts. Used (Flawed) - Used item with major signs of wear, and/or missing components, but still works. Ibanez GSR200 Electric Bass Guitar with Extra Tuner and Cables Bundle. Ibanez TR Bass Black PJ PU 2Vol 2Tone Good Condition Free International Ship! Ibanez TR Bass Black PJ PU 2Vol 2Tone Good Condition. Contols: 2Vol,2Tone. Ready to play when you get. Unless it will be very carefuly bubble wrapped and put into a cardboard box. Color: Black. Weight: 4.2kg. IBANEZ GSR200 in Jewel Blue! ABOUT THE IBANEZ GSR200. A guitar doesn't have to cost a bundle to sound good. Inlay: Pearl Dot Inlay. During this process we also double check that everything functions as it should. Ibanez TR BASS. A model for entry users of Ibanez, one of the world's leading guitar makers, representing Japan. Color : Sunburst. The condition of the truss rod is good. Ready to play when you get. IBANEZ GSR200 in Transparent Red! ABOUT THE IBANEZ GSR200. A guitar doesn't have to cost a bundle to sound good. During this process we also double check that everything functions as it should. Guitar is professionally detailed and inspected. Circuit: active 3-band equalizer - < br> features - Remarks: This is Ibanez and Shimamura musical collaboration model. Active pickup, is available with a 3-band equipped with the equalizer a wide range of sound making. Ibanez GSR 200 Bass Trans Red Finish Professionally set up! You are viewing a new Ibanez GSR200 bass in a trans red finish that has been professionally set up by our guitar technicians. Active EQ w/bass boost. This guitar has been professionally setup to play great! 4.5 out of 5 stars - Ibanez GSR 200 Bass Trans Red Finish Professionally set up! 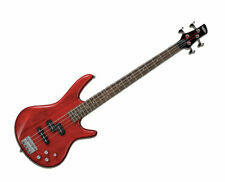 3 product ratings3 product ratings - Ibanez GSR 200 Bass Trans Red Finish Professionally set up! Pickup: Ibanez original PJ layout. Nut width: about 38 mm. Truss rod : Unknown. Color: TR Tran Red. Serial number: MADE IN JAPAN F9922xxx. This has small scratch marks or paint peeling and dent, but not obtrusive much, Nice condition. The Agathis body used for the Ibanez GSR200 provides the player with warm lows and strong sustain. - Agathis body, maple bolt on neck. GSR200 Electric Bass Guitar by Ibanez. Buying a "beginner bass"?. Not Your Regular Beginning Bass. Active EQ with PHAT-II Bass Boost. Split-coil and single-coil pickup combination. New Gear: If you’re not satisfied, neither are we. ·Condition : Used · There are small scratches or paint peeling and dent, but not noticeable much, Good condition. · ·The neck is straight. Play condition is excellent. ·Truss rod : Unknown ·The decrease of fret is 10%. ·Sale with No case, No document. No problem with the output and electrical system. The neck is straight. Play condition is excellent. We can not use EMS. The Ibanez GSR200 4-String Bass is a hot little bass with nice balance and feel for a very friendly price. Active EQ with PHAT-II Bass Boost. Split-coil and single-coil pickup combination. New Gear: If you’re not satisfied, neither are we. 1999 IBANEZ / Fujigen SDGR SR720 TR MIJ. PJ Bass Maple FB Slim Neck. Neck: Maple (Slim Neck). Fingerboard: Maple. Neck is straight. Ready to play when you get. Can't find what you are looking for?. Unless it will be very carefully bubble wrapped and put into a cardboard box. IBANEZSDGR SR720 TR MADE IN JAPAN 1999. Truss rod works fine. Color : Red. Sorry for your inconvenience if it happens. This item is also listed for other platform. Body:There are scratches / dents. ·Condition : Used · There are small scratches or paint peeling and dent, but not noticeable much, Good condition. · ·The neck is straight. Play condition is excellent. ·Truss rod : Unknown ·The decrease of fret is 20%. ·Sale with No case, No document. Ibanez black electric bass guitar with hard travel case TR-80. Made in Korea. Condition is Used. The bass you are looking at is in good shape. This bass plays great and sounds even better! Gully no problem. [Body]: There are scratches, playing scratches. [neck]: There is no problem in playing. [Fret]: 8 to 90 percent remaining. [ Remaining rod]: enough. [State]: B Tested. - goods state -. Ibanez ssr620tr bass guitar electric bass, Serial number . No problem with the output and electrical system. The neck is straight. Play condition is excellent. Condition : Used. Ex condition! Ibanez GSR200TR. A guitar doesn't have to cost a bundle to sound good. 4-String Electric Bass Guitar - Transparent Red. Bridge : B10 bridge (19mm string spacing). Radius : 305mmr. D : Thickness at 12th : 22mm. The Ibanez GSR200 4-String Bass is a hot little bass with nice balance and feel for a very friendly price. Active EQ with PHAT-II Bass Boost. Transparent Red. Split-coil and single-coil pickup combination.